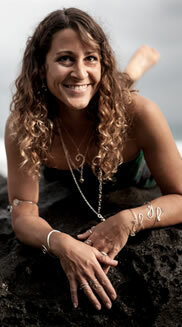 Toni Cordas has been making jewelry since 1993 and founded Hawaii Jewel in 2010. A graduate from Miami University, in Oxford, Ohio, with a Bachelor’s Degree in Metalsmithing, Toni now lives on the Island of Kauai and is inspired by the magical beauty that surrounds her. 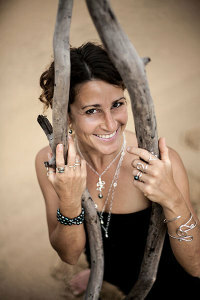 Toni is the only jeweler on Kauai hand-bending and hammering Plumeria flowers out of silver and gold – so each flower and each piece of jewelry is unique. Another “hallmark” of Hawaii Jewel, is free shipping and quick fulfillment of orders. Most pieces are in stock and orders typically go out in the mail within 2 days of being placed. If you are looking for a special, unique gift for ladies of all ages, Hawaii Jewel has something for every taste. Hawaii Jewel jewelry is simple, elegant and timeless and the perfect wearable keepsake to remember your visit to Kauai. Toni’s mismatch earrings are her bestsellers. And don’t forget the “guys”, they love Hawaii Jewel jewelry too. The men’s favorites are typically the Black Tahitian Pearl necklace and the silver and gold rings. “I try to price my jewelry in a range that my mom and I could afford (she loves to shop and she is quite the bargain shopper!). Your jewelry is beautiful. I’m considering ordering a pair of earrings for my fiance and I’m wondering when I can expect receive them if I order them today? My advice for buying jewelry is only buy pieces that you “know” are YOU before you even try them on. If you know you would think about the jewelry if you DIDN’T buy it, and know it is something you would wear all the time, then you’ve got a “keeper”! The Grace of Kauai lives in every Hawaii Jewel piece. Toni offers free USA shipping for all her jewelry orders and is happy to upgrade to priority shipping for customers who need their order to arrive quickly. Each order comes in hula girl tissue paper and a satin gift bag embossed with “Hawaii Jewel” in shiny pink lettering and each order receives a handwritten thank you card from Toni herself. You can feel the care and Aloha that goes into creating each individual piece of jewelry. If you need help choosing a design that is best suited for you or as a gift for someone else, Toni can help with that too. Or if you need a demonstration on how to wear the bracelets (they are fitted and go on from the side) or the mismatch earrings (how to thread them through the ear), Toni is happy to assist. Toni can also provide an education on the types of metal used in her jewelry. If you would like to meet Toni and watch a demonstration of how she creates her jewelry, visit her at the Hanalei Farmers Market on Saturdays, 9:30-12. As well as a selection of jewelry for sale, Toni has her metalsmithing tools on display including a rawhide mallet (from her Grandpa), a chasing/ball peen hammer, steel ring mandrel and a variety of pliers.